If you have a Silverlight application, chances are that you are looking for a way to migrate it to other technologies. In fact, Chrome, Edge, and mobile browsers have stopped supporting it long ago, and FireFox has also stopped supporting it in March 2017. If your app targets only Windows-based devices, and if deployment is not an issue for you, you may consider migrating your application to WPF or UWP. However, if you want your app to run in the browser, or if you want to reach more platforms, you will likely find C#/XAML for HTML5 a compelling choice. In fact, C#/XAML for HTML5 is the only solution that lets you reuse most of your SL code, keep coding in a Silverlight-like way, and at the same time generate cross-platform HTML5-based apps. Your apps run on any modern browser, without the user installing any plugins, and you can even package them for deployment on iOS and Android via PhoneGap/Cordova, as well as other devices such as Chromebooks, Macs, and Linux-based devices. C#/XAML for HTML5 (also called "CSHTML5") is an extension for Visual Studio that adds a new kind of project to the "New Project" dialog. This new kind of project is called a "CSHTML5 Project". A CSHTML5 project is very similar to a Silverlight/WPF project, in that it contains mainly C# and XAML files. For example, a blank new CSHTML5 project is almost identical to a blank new Silverlight/WPF project: it contains App.xaml, App.xaml.cs, MainPage.xaml, and MainPage.xaml.cs. Keep reading for more information and a detailed tutorial. You can keep leveraging the existing C#/XAML/.NET/VS skills of your team members, instead of forcing them to move to other languages, frameworks, and/or IDE. You can share C# code between the client and the server. This is particularly useful for sharing business objects and entities passed between the client and the server. You can share code using the "Add as link" feature of Visual Studio, and write compiler directives to conditionally comment out portions of the code that are not supported in CSHTML5. You can keep leveraging the power of the C# and XAML languages (type safety, viewmodels, user controls, generics, datatemplates, async/await, namespaces, accessibility modifiers, exception handling, etc. ), a subset of the .NET classes (WCF, Linq, etc. ), and the powerful Visual Studio IDE (refactoring, debugging, intellisense, source control, snippets, immediate window, code analysis, etc.). Those languages and tools were designed since the beginning to enable the creation of large-scale enterprise-grade rich applications. You can share C# files between the original Silverlight/WPF project and the migrated CSHTML5 project (using the "Add as link" feature of Visual Studio, and compiler directives to specialize portions of the code). This is particularly useful if you would like to keep - at least for a short period of time - both the migrated version AND the original version of your app, in order for example to go to market faster by not having to migrate the whole application at once, or if you want to keep the old application available for a while to at least some kind of users (eg. administrators). 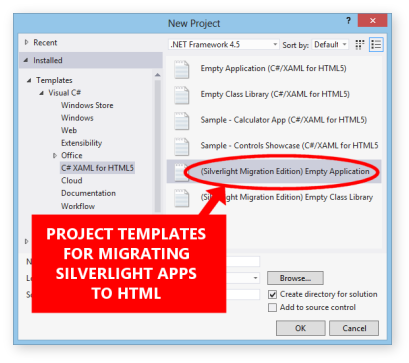 Create one project of type "C#/XAML for HTML5 (Silverlight Migration Edition)" for each of the Silverlight/WPF projects that you want to migrate. For example, if your solution has two projects: "MyApplication" and "MyClassLibrary", you should create two separate new projects: one project of type "(Silverlight Migration Edition) Empty Application", and another project of type "(Silverlight Migration Edition) Empty Class Library". In this tutorial, let's assume that you have given the following name to your new CSHTML5 projects: "MyApplication.Cshtml5" and "MyClassLibrary.Cshtml5". Copy/paste all the C#/XAML files contained in your Silverlight/WPF projects into the newly-created CSHTML5 projects (with the exception of "App.xaml" and "App.xaml.cs", which you may want to merge manually). To ensure that the folders structure is preserved, a technique is to open Windows Explorer, select all the files and folders contained in a project (with the notable exception of the folders "bin", "obj", "Properties", and the files "App.xaml" and "App.xaml.cs", which you may want to merge manually), then copy them to the clipboard (by pressing Ctrl+C), then go to Visual Studio, select the CSHTML5 destination project in the Solution Explorer panel, and press Ctrl+V. This will paste all the files into the selected project, while recreating the folders structure. Alternatively, instead of copying the files (which will result in redundant duplicates), you can share the files between the Siverlight projects and the CSHTML5 projects. To do so, you can use the "Add as link" feature of Visual Studio: right-click on the destination CSHTML5 project, click "Add => Existing Item...", browse to the original Silverlight/WPF project, select the C# files, and then click "Add as link..." (if you do not know where the "Add as link" button is, look at the screenshots here). - In the current version of CSHTML5, you are encouraged to share C# files, but not to share XAML files, because XAML files do not let you write "compiler directives" to specialize portions of the code, so it may not be practical to adapt the XAML code to CSHTML5 while maintaining compatibility with the original Silverlight/WPF XAML code. Make it so that the new projects reference each other in the same way that your Silverlight/WPF projects reference each other. For example, if "MyApplication" references "MyClassLibrary", you should make it so that "MyApplication.Cshtml5" references "MyClassLibrary.Cshtml5". Try compiling your CSHTML5 project and fix the code until it compiles properly. If your solution contains multiple projects, instead of trying to compile the whole solution at once (which may result in an unmanageable number of errors), it is recommended that you start by attempting to compile only the smallest projects that have no dependencies (ie. the projects that do not reference other projects). Once you are able to compile those projects, you can move on to attempting to compile larger projects or projects that have more dependencies. Usually, you start with the class libraries, and the main application project is the last one that you attempt to compile, after everything else compiles properly. - You can do a find-and-replace in the whole project to replace "HashSet<" with "HashSet2<" with "HashSet2<" (this is a limitation of the current version that is expected to be fixed in the future). Other incompatibilities may require more work to be fixed. Therefore, if you can temporarily disable a feature that is not supported, or comment out a piece of code that is not compatible, it is strongly recommended that you do so at this stage, in order to move on and to start testing the application as early as possible in the migration process. You can come back to address the issue after every else works fine. For example, if you can initially comment out some ControlTemplates (located in your XAML styles) without loosing core functionality in your application, it is strongly recommended that you do so. In fact, ControlTemplates may use complex animations or visual states that need to be migrated, so it may be a good idea to postpone their migration to a later phase. After you have managed to get your application to run fine, you can come back and uncomment the ControlTemplates one by one.e ControlTemplates one by one. - Ask the author of the 3rd party control, or ask the CSHTML5 community, or ask the CSHTML5 Support to implement it for you. - In the current version, the XAML designer sometimes causes some incorrect errors to be displayed in the Errors panel of Visual Studio. To make sure that you only see the "real" errors, make sure to close all the open XAML designer tabs before compiling the project. - It is usually better to fix the XAML errors before fixing the C# errors because the errors displayed for C# files are accurate only after the XAML files compile properly. Be sure to read the Limitations and Known Issues page. After your CSHTML5 project(s) compile properly, you can finally launch the application to ensure that it runs properly. At the beginning, you may see some differences in the layout due to the HTML5 rendering engine. You can use the Simulator (which appears when you launch the CSHTML5 application) to do step-by-step debugging in your C# code, and you can use the "Inspect Visual Tree" feature of the Simulator to understand where the differences originate from. After you have managed to get the application to run fine in the Simulator, you should test it in the web browser. To do so, click the "Run in browser" button that is in the Simulator. You can test on different browsers to ensure that the result is the same on all browsers. The browser that has been tested the most with CSHTML5 is Chrome, but other browsers such as Edge, FireFox, and Safari are also supported and should provide the exact same result. - Client/server communications and WCF: this may be related to cross-domain calls, which are limited when running in the browser. You can open the browser Console log (F12) to see any error messages. You can fix cross-domain issues by implementing CORS. - Linq: some rare features of Linq are not yet supported in the browser. You will see an error in the browser "Console" if you use an unsupported feature. Compatible with most browsers. The files will run on Chrome, Edge, Firefox, Safari, IE11+, and more. Note: some browsers, for security reasons, may disable some features - such as Geolocalization or IsolatedStorage - when the files are run from the local file system (ie. when the URL in the browser address bar starts with "file:///..." instead of "http//" or "https://"). During development, this can be easily fixed by uploading the files to a web server, or by using the built-in "Run from localhost" feature of the CSHTML5 Simulator (you will find the "Run from localhost" option by clicking the small arrow located near the "Run in browser" button of the Simulator). You can communicate with the server via Web Service calls. CSHTML5 is a client-only technology, similar to Silverlight but without the need for browser plugins. A subset of WCF is supported. You can use the "Add Service Reference" feature of VS to communicate with SOAP web services, or you can use the WebClient control to communicate with REST web services (WebAPI or other). Learn more by reading the WCF Limitations and Tutorials. Alternatively, you can communicate via WebSockets by using the open-source WebSocket extension for CSHTML5, or via SignalR. Due to the fact that RIA Services are not supported at this time, you should replace them with standard WCF SOAP service calls (read WCF Limitations and Tutorials). To make the migration easier, a common practice is to create a new server-side project of type "WCF Service Application" that references your server-side RIA Service and functions as an "adapter" (or "bridge") that will relay the communications between your CSHTML5 app and your RIA Service. In other words, instead of communicating directly with the RIA Service, your CSHTML5 application will communicate with your WCF service - which exposes SOAP endpoints -, and the latter will then communicate with your RIA Service via simple method calls (because they run in the same process on the server). We recommend redefining the business entities that are passed between the client and the server if they are too complex or if they have dependencies on EntityFramework (which is currently not supported). It works exactly as in Silverlight. To see some examples and source code, check out the sample Showcase application (to do so, launch VS, click File => New Project => C#/XAML for HTML5 => Sample Showcase). Styling works exactly as in Silverlight. Please visit the Styles and Templates page for some examples of styles. You can easily save/download a file to the end-user computer by using the open-source FileSaver library for CSHTML5. Some web browsers will display a window similar to the Silverlight SaveFileDialog for choosing the file name and destination folder, while other browsers will simply download the file to the Downloads folder. You can use the open-source FileOpenDialog library for CSHTML5. You can print any UIElement in the visual tree using the built-in Printing Features, or, alternatively, using the open-source PrintHelper library for CSHTML5. You can use the open-source ZipFile library for CSHTML5, which provides a subset of the functionalities of Ionic.Zip DotNetZip. Out Of Browser is useful for many reasons, including the ability to run code that requires Elevated Privileges ("Full Trust"), for example to communicate with USB ports, to interact with installed apps (Office Automation/Interop...), to access restricted folders on the File System, and, more generally, to do anything that you are not allowed to do inside the web browser. There are multiple ways to implement Out Of Browser support for CSHTML5 applications. A common way is to take the output HTML/JS files of your application and make a Windows/Mac/Linux executable out of them. You will find many free tools to do that. Alternatively, you can do this manually by following these simple steps: create a new project of type "WPF application", put a web browser control on the MainWindow (you can either use the default IE-based WebBrowser control, which uses the same version of IE that is installed on the end-user machine, or, better, you can use the CEFSharp control which contains an embedded Chromium browser that has no dependencies and that renders the same on all the machines regardless of what web browser is installed) and add some code to the constructor of your MainWindow to make the web browser URL point to your local HTML/JS files generated by your CSHTML5 project. This technique has several benefits, including the ability to move C#/XAML code that requires Elevated Provileges directly into the WPF application, and then to have your CSHTML5 application communicate with the "host" WPF application via simple JS interop calls. Bug Fixes: they are resolved free of charge, usually in 3 to 10 business days depending on the complexity of the bug. If you own a Silverlight Migration Edition license, your support tickets are handled with higher priority. Custom Developments to accelerate the implementation of missing features. This is the most popular form of support, as more than a hundred features have been developed in the past thanks to companies willing to contribute to accelerate the development of those features. If you need a specific feature to be implemented, and you do not want to implement it on your side (in C# or via C#/JS interop), we can send you an estimation of the cost to have us implement it for you. If the feature is a highly requested feature, we can split the development cost 50/50. Customers have been very happy with the short delivery times and high quality of the results. Analysis of your codebase: we can analyse your application under NDA to report the differences between your current functionality and our implementation/future roadmap. Please contact us if you are interested. Full Migration of your application. Please contact us to discuss this topic. Please also have a look at the Forums to see if your question has already been answered by a community member. Tickets are usually replied to within 24-48 hours. The support team speaks English, French, and Italian. If you own a Silverlight Migration Edition license, please mention it in your ticket for higher priority.